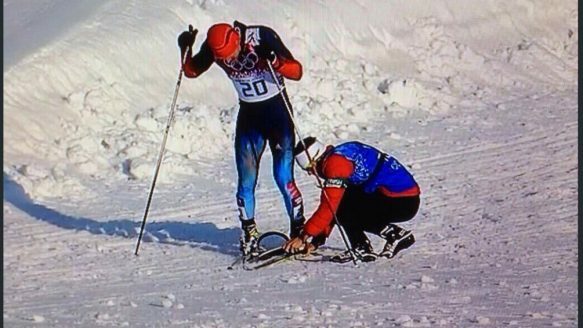 SOCHI, RUSSIA—After his own miserable afternoon in the midst of the greatest 24 hours in our Olympic history, Canadian cross-country ski coach Justin Wadsworth wandered over to the finish line. As he stood there, surrounded by other officials, he spottedRussian Anton Gafarov coming over a rise. Gafarov, an early medal favourite, was struggling miserably. He’d crashed on a quick downhill corner and broken a ski. Then he’d crashed again. A long, thin layer of P-Tex had been skinned off his ski. It was now wrapped around his foot like a snare. Gafarov was not ‘skiing’ to the finish. He was dragging himself. “It was like watching an animal stuck in a trap. You can’t just sit there and do nothing about it,” Wadsworth said later. In a race typically decided by tenths-of-a-second, Gafarov was three minutes behind the pack. He was trying to make it the last couple of hundred metres down the 1.7 km course. Wadsworth grabbed a spare ski he’d brought for Canadian racer Alex Harvey and ran onto the track. Gafarov stopped. Wadsworth kneeled beside him. No words passed between them. Gafarov only nodded. Wadsworth pulled off the broken equipment and replaced it. Gafarov set off again. “I wanted him to have dignity as he crossed the finish line,” Wadsworth, a three-time Olympian, said. That. That right there. That’s the Olympics. If you don’t get a lump in throat thinking about what Justin Wadsworth did for a man he doesn’t know to speak to, but recognizes as a friend in sport, then you should head to the ER. You need a heart transplant. The moment circled back perfectly to Sara Renner in Torino 2006, and the Norwegian official who tossed her his own pole once she’d lost hers. Renner won silver for Canada. Norway finished fourth. He doesn’t say anything there about winning. The important thing is the fight, and not just that. Fighting the right way. Every two years, we send our best to the Olympics hoping they will express something essential about all the rest of us. All we ask is that they represent us with pride. On that basis and more, Canada has just enjoyed the finest day in its Olympic history. Sochi is the 47th Games — summer and winter — we have participated in. For 18 hours between late Monday night and early Tuesday evening, Canada led the total and gold medal count. For the first time ever. We can point at the podiums — and for the third time here, there were two winsome and utterly charming young athletes to fall in love with on that score. Dara Howell and Kim Lamarre took gold and bronze, respectively, in the ski slopestyle Tuesday morning. Lamarre had been dropped from the national program a year earlier after tearing up a knee. If you feel like it, you could spend all day wandering around Olympic venues here, bursting into tears. Because of Justin Wadsworth’s simple act of sportsmanship, it becomes a great Canadian moment. He’s an American by birth. It hardly matters. He lives in B.C. His kids are Canadian. He’s wearing our colours. He’s us. Or, at least, the ‘us’ we’d like to think we are. We’re here first and foremost in the spirit of friendly competition. When we win, we want to do it the right way. We don’t want it to be about the skis. Talking about it, Wadsworth circled back to Hakensmoen and Renner. Well, Wadsworth was standing amidst several coaches. He was the only one who thought to help. The best part of this story? When I talked to him, about two hours after it all went down, Wadsworth wasn’t clear on why I wanted to. Because of the thing with Gafarov, I said. He was surprised anyone would care. At the end, I congratulated him. I suggested that what he’d done was the real Olympics, the real reason we all care so much. Wadsworth seemed embarrassed. Then he laughed, and said something that reminds you who these people are. That’s us, Canada. Friends and fighters. For one magical day, more resonantly than ever before, the world was reminded of both.